Furnifold Fernie Harrell was the first child born to Ezekiel Perry Harrell and Anna (Unknown). Fernie was born 23 Sep 1826 in North Carolina. Ezekiel Perry Harrell and Anna had at least six children. Many listings of the children of Ezekiel and Anna only show five - combining Mary and Ellen into one person named "Mary Ellen". The 1850 Duplin Co, NC, Census shows two different sisters - one named Mary A. and the other named Ellen. 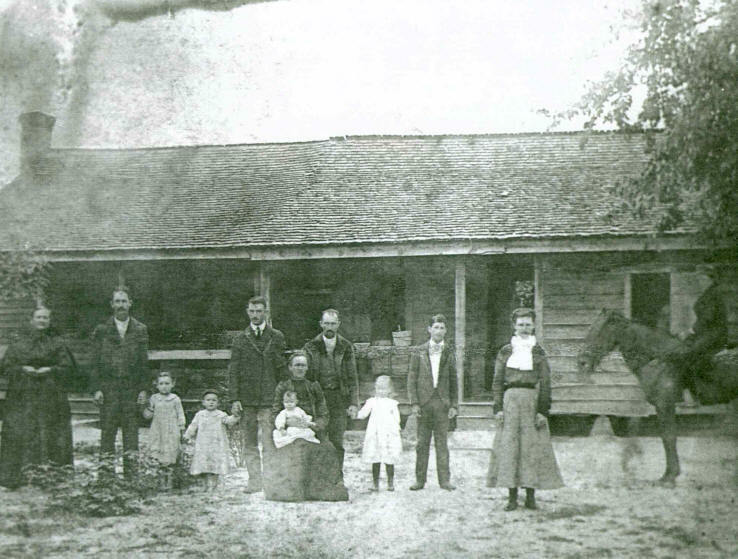 The 1840 Census shows the Ezekiel Perry Harrell family living in Duplin County, NC. The 1850 Census shows the Ezekiel Perry Harrell family still living in Duplin County, NC (the North Division). Ezekiel and Anna have 4 children listen on the Census: Furney (age 18), Mary A. (age 16), Ellen (age 13) and Cassa (age 9). There is also a young woman named Mariah Conoly and what appears to be her two small children (Caridya & John S Conoly) living with the Harrell family. The ages of most of the Harrell Family are incorrect. If Ezekiel Perry Harrel was born is 1800 as most believe, he would have been 50-years-old instead of 40. Fernie's age is listed as 18 but he would have actually been 23. (His birth date and death date are on his headstone in the David King Cemetery.) Even if Fernie's younger Census age of "18" was correct, Anna would have only been 14 years old when he was born. Tradition has her born around 1808 meaning her correct age would have been around 42 instead of 32. No 1860 Census has been found for Fernie Harrell. The 1860 Census shows Ezekiel and Anna Harrell living in the Town of Goldsboro in Wayne County, NC, with their youngest daughter Catherine (age 17) and a young boy (Edward) Julian Harrel (age 1) who most researchers list as a son of Ezekiel's, too. During the Civil War, Fernie Harrel enlisted in the Confederate Army on 09 Jul 1861 in Wayne County, NC as a Private. He served as part of Company C, 2nd Infantry Regiment NC . Records list his age as 24 but actual age was 34. Fernie was with Company C, 2nd Infantry Regiment NC on 09 Apr 1865 when Gen. Robert E. Lee surrendered at Appomattox Court House, VA.
Fernie Harrell married Sally King on 14 Dec 1865 in Wayne County, NC. Sally was born 16 Sep 1845 in Sampson County, NC, and was the daughter of William Rufus King (b. 16 Dec 1812) and Mary Polly Manly (b. 1814). Fernie was 19 years older than his bride. Fernie and Sally King Harrell had 13 children (according to the 1900 Wayne County Census). No 1870 Census has been found. Page 71 of the 1880 Wayne County, NC, Census shows the Fernie Harrell family living in Brogden. 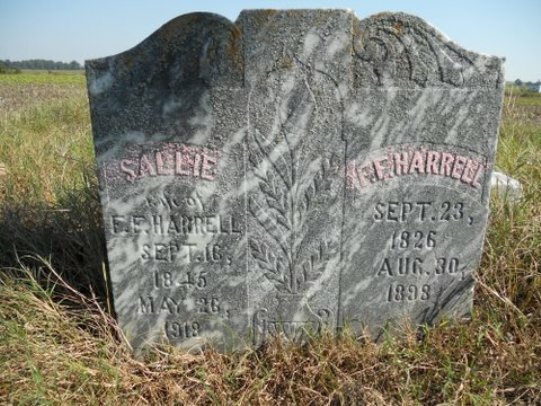 Fernie's age is listed as 52 (he was actually 53) and Sallie is listed as 30 (she was actually 34). 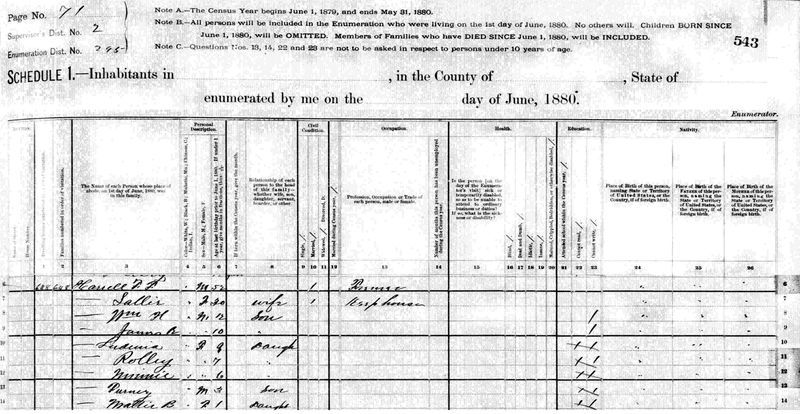 The children listed on the Census were: Wm. H. (William Henry - age 12), James R. (age 10), Ludenia (age 9), Polley (age 7), Minnie (age 6), Furney (age 30) and Mattie Byrn (age 1). 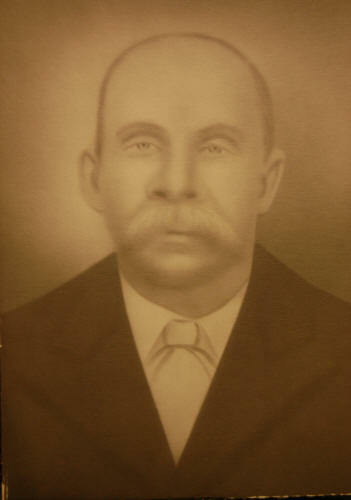 Furnifold Fernie Harrell died 30 Aug 1898 iN Sampson County, NC, at the age of 71. He was buried in the David King Cemetery - located three miles west of Mount Olive, Wayne County, NC, on Highway 55. The 1900 Census shows Sally King Harrell living in Wayne County with her four youngest children: Furney Arthur Harrell, George R. Harrell, Sallie K. Harrell and Lee Edward Harrell. The Census shows birth month and year, but for most of the family they are incorrect. Sally was renting the family home. Fernie and Sally's two oldest sons and their families lived nearby. William was married to Virginia L. Best, who apparently was nicknamed "Hannie", and had two children: Pearl (age 3) and Aaron (age 8 months). James was married to Metta Florence McClenny and they had a daughter Manie Harrell. 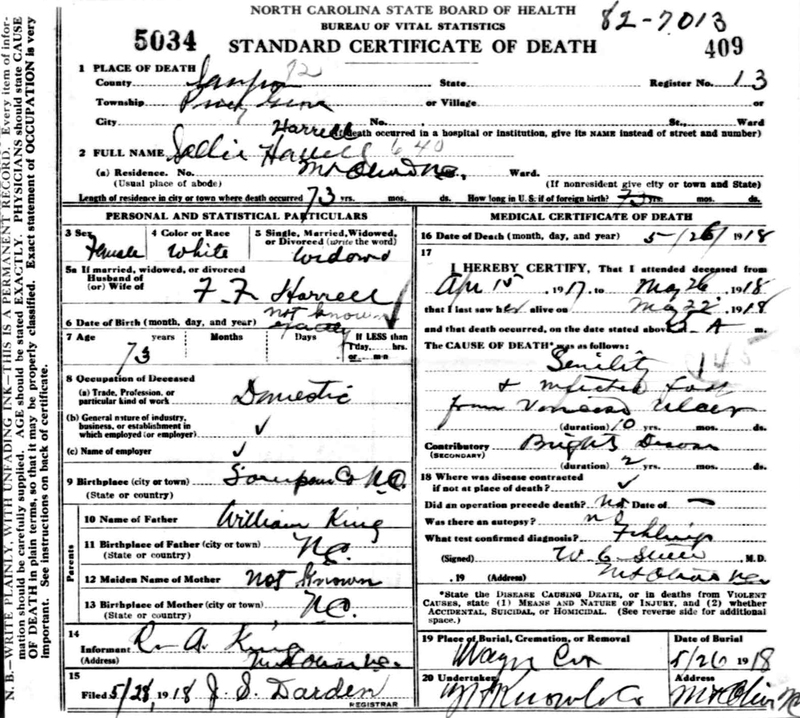 The 1910 Census shows Sallie King Harrell living with her son James R. Harrell and his wife, Metta Florence McClenny in Sampson County, NC. James and Metta had five children: Mamie (age 11), Mary (age 7) Milford (age 5), Gunthry (age 2) and Sallie Venita (age 6 months). The Census does show that Metta had lost one child (Mae). Living nearby was Sally & Fernie's daughter Mattie Byrn Harrell Weeks, with her husband James Henry Weeks and their 5 children. Sally King Harrell died 26 May 1918 at the age of 73 - caused partially by "Senility". She was buried in Wayne County, NC, near Fernie. If you have additional information on Furnifold Fernie Harrell please contact me.